Cholera is a bacterial disease that normally spreads through contaminated water. 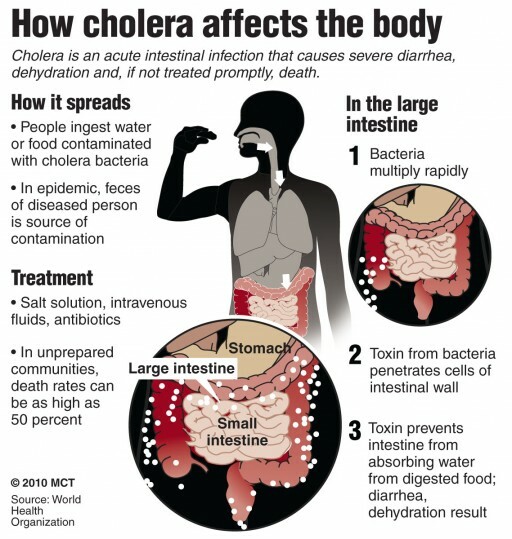 Cholera causes dehydration and severe diarrhea. If cholera is not treated, it can be fatal within a short span of a few hours, even in people who were are considered healthy. Cholera is easily treated. However death, typically results from severe dehydration that can prevent with a simple and inexpensive rehydration solutions. Most people that are exposed to cholera bacterium (Vibrio cholera) will not become ill and may never know they have been infected. How we, because they shed cholera bacteria in the stool for seven to 14 days, the contaminated water can still infect others. The most prevalent cases symptoms of cholera cause mild to moderate diarrhea and is often difficult to distinguish from diarrhea caused by other problems. Nausea and vomiting – This typically happens in the early stages on cholera, vomiting may persist for hours at a time. Dehydration – Dehydration can develop within only a couple of hours after the onset of cholera symptoms. It depends on how much body fluid has been lost, dehydration can range from mild to severe. A loss of more than 10 percent of total body weight indicates severe dehydration. Dehydration can lead to rapid decline of minerals in your blood (electrolytes) that control the balance of fluids in your body. This is called an electrolyte imbalance. Shock– this is the most serious complication of dehydration. It transpires when low blood volume causes a decrease in blood pressure and a drop in the amount of oxygen in your body. If this is not treated, the severe hypovolemic shock causes death within several minutes. Muscle cramps – These result from the rapid loss of salts such as chloride , sodium and potassium. The risk of cholera is very low in industrialized countries, even in endemic areas where you are not likely to become infected if you follow food after a recommendation. However there are sporadic cases of cholera occurring throughout the world, if you develop severe diarrhea after visiting an area wit active cholera, see your doctor. If you have diarrhea or severe diarrhea, and you think ou have been an episode to cholera, this is a medical emergency and will require treatment right away. Severe dehydration is a medical emergency and requires treatment right away regardless of the original cause. Contaminated water supplies are the main source of cholera infection, although uncooked fruits and vegetables and raw shellfish and other foods can have V. cholera. 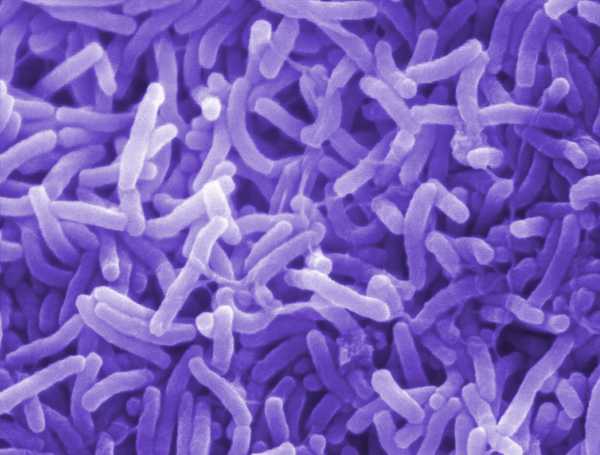 Cholera bacteria has to life cycles on in the environment and another one in humans. Cholera bacteria in the environment. When humans ingest cholera bacteria the many not become ill themselves, however they still pass the bacteria in their stool. When human feces begins to contaminate food and water supplies, both can serve as model breeding grounds or the cholera bacteria. The most common methods of cholera infect are standing water and certain food types, which include raw fruits, raw vegetables, grains, and seafood. Surface to well water – Cholera bacteria can lie dormant in water for long periods of time, and contaminated public wells are frequent sources of large-scale cholera outbreaks. People living in crowded conditions without adequate sanitation are especially at risk for cholera. Seafood – eating raw or undercooked seafood, especially shellfish, that originates from locations exposed to cholera bacteria. Raw fruits and vegetables – Raw unpeeled fruits and vegetables are a Frequent source of cholera infection in areas where cholera is endemic. These can be developing nations, uncomposted manure fertilizer, irrigation water containing raw sewage, contaminating the field. Grains – In regions where there is cholera widespread, grains such as millet and rice can become contaminated after cooking and allow to remain at room temperature for several hours, becoming a breeding area for cholera bacteria growth. Poor sanitary condition. Cholera is more likely to flourish in a condition where water supply is difficult to maintain. These conditions could be areas of natural disasters, impoverished countries, refugee camps, areas devastated by famine. Reduce or no stomach acid (hypochlorhydria or achlorhydria) . Cholera bacteria can not survive in an acidic environment, the ordinary stomach acid often serve as the first -line of defense against infections, people with low levels of stomach acid, such as children , older adults and individuals who take antacids, proton pump inhibitors, or H-2 blockers , are at greater risk for cholera. Household exposures, Your chances of getting cholera increases significantly if someone you live with has the illness. Type O blood, For reasons that are not entirely clear, people with type O blood are twice as likely to develop cholera. Raw or undercooked shellfish– eating shellfish from water known to have the cholera bacteria significantly increases your risk. Cholera can quickly become fatal, due to the rapid loss of large amounts of fluids and electrolytes, leading to death in two to three hours. In less extreme circumstances, people who do not receive treatment may die of dehydration and shock hours or days later after the symptoms first appear. Low blood sugar (hypoglycemia ) -low levels of blood sugar (glucose) which is the body’s primary energy source. this can happen when someone is too ill to eat. Children are at the greatest risk for this, causing unconsciousness, seizures and death. Low potassium levels (hypokalemia ) Individuals with cholera lose many minerals, including potassium in their stools. Very low potassium levels interfere with nerve and heart functions and can be life-threatening. Kidney ( renal) failure – When the kidneys lose their ability to filter excess amounts fo fluids, some electrolytes and waste build up in the body in people with cholera, often accompanied by shock. Although severe cholera may be evident through the symptoms in endemic areas, the only way to establish a diagnosis is to identify the bacteria in a stool sample. Rapid cholera dipstick test is available, enabling health care providers in a remote area to confirm the diagnosis of cholera earlier. Quicker confirmation helps reduce death rates at the start of cholera outbreaks and leads to faster public health interventions for outbreak control. Antibiotics – while antibiotics are not the necessary art of cholera treatment, some antibiotics may reduce the amount and duration of cholera caused diarrhea. A single dose of doxycycline ( Vibramycin, Monodox, Oracea) or Azithromycin (Zmax, Zithromax) can be helpful. Zinc supplements – Research as shown that signs it may decrease and shorten the duration of diarrhea in children with cholera. 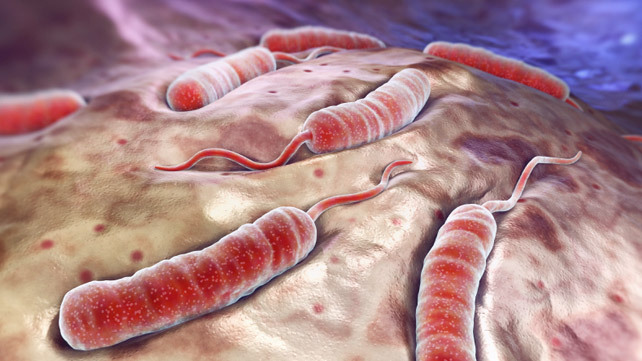 Cholera is rare in developed countries with a few cases related to travel outside to developing countries or regions that are contaminated and improperly cooked seafood. If you are traveling to a cholera-endemic area your risk of contracting the disease is extremely low if follow these precautions. Drink only safe water, including bottled, or boiled water. Hot beverages are generally safe and canned or bottled drinks are as well. Wipe the outside before you open them. Eat foods that are completely cooked and hot, avoid street vendors if possible, make sure it is cooked in your presence and serve hot. Avoid sushi and well as raw improperly cooked fish and seafood of any kind. Stick to first and vegetables you can peel yourself, bananas, avocados and oranges. Do not eat grapes, salads and fruits that are not peeled, including berries. Avoid dairy foods, which can be contaminated with pastured milk. Cholera vaccine – for adults traveling to cholera- affected areas, the vaccine is now available in the US. The U.S food and Durg administration approved Vaxchora, a vaccine for prevention of cholera. It is a liquid does take by mouth 10 days before travel.